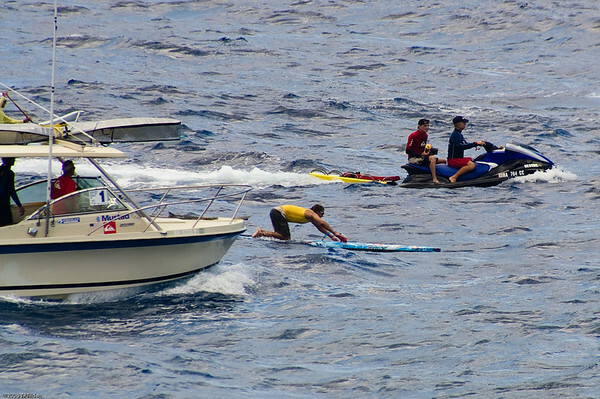 On Sunday 120 Paddleboarders and Stand up Paddlers made the crossing of Kaiwi Channel from Kaluakoi on Molokai to Maunalua Bay Beach Park in Hawaii Kai. 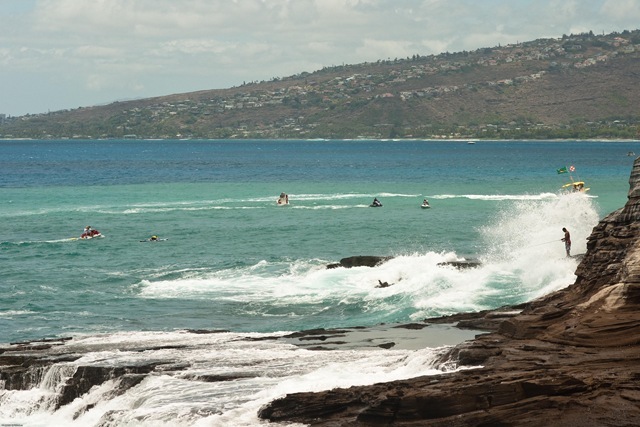 Portlock Point on Kokohead is a good place to watch the paddlers as they enter Maunalua Bay before making the final dash to the finish line about two miles away. Just before they disappear around China Walls I got this picture of a fisherman amidst the swells crashing against the ledges. Fortunately, he wasn’t swept away but it isn’t the best spot to catch dinner. 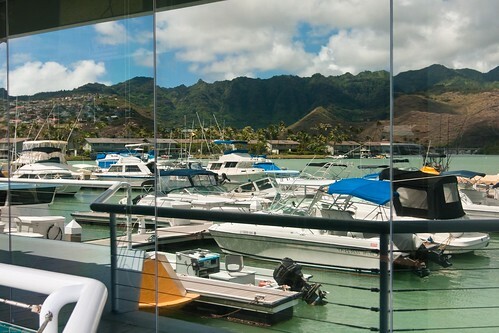 Hawaii Kai will be a focus of some serious sports activity this Sunday. The 40K bicycle portion of the Tinman Triathlon is coming out to Hawaii Kai in the morning and then back to Kapiolani Park. 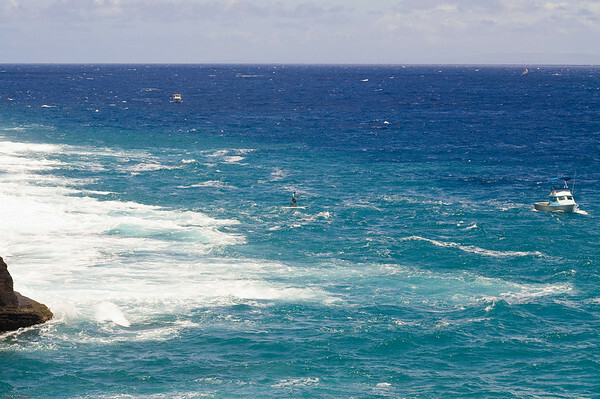 Then starting around noon the first of a long string of Paddleboarders will be completing the 32 mile crossing from Kaluako’i Beach on Molokai to Maunalua Bay. While most will be lying down while they do that some will be standing the whole way! Makes me tired just thinking about it. Driving around Makapu’u Point on Oahu you might notice Paragliders and or Hanggliders flying above the beach. The Landing Zone at Kaupo Beach will have a gaggle of just landed PG or HG pilots swapping stories about how great the flying was. This time of year another group of flyers will be taking to the air from the same place. This group doesn’t need flying harness, variometer, or parachute. They use what God gave em. Feathers. They are racing pigeons getting in their preseason workouts. In August their owners will send them over to Molokai or Maui or the Big Island and have them released to fly back to Oahu. The fastest ones will be high on the pecking order. I didn’t realize how popular pigeon racing was until I talked to the breeders while they released their pigeons. For instance, South Africa is the home of the richest One-Loft Race in the world, the Sun City Million Dollar Pigeon Race. The Sun City Million Dollar Pigeon Race pits 4,300 birds from 25 countries against each other for a share of $1.3m in prize money. The runners-up win cars and smaller monetary prizes, while the overall winner can expect to pocket $200,000. 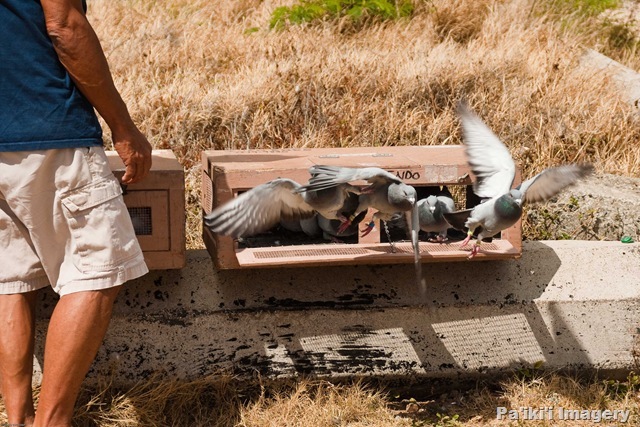 Sun City’s "one-loft" race, sees birds from across the world air-freighted to South Africa as squabs, months before the race, and trained to orientate to a single loft. On race day, after being released 550 km (330 Miles) out on the South African veldt, the birds all race back to the same destination. 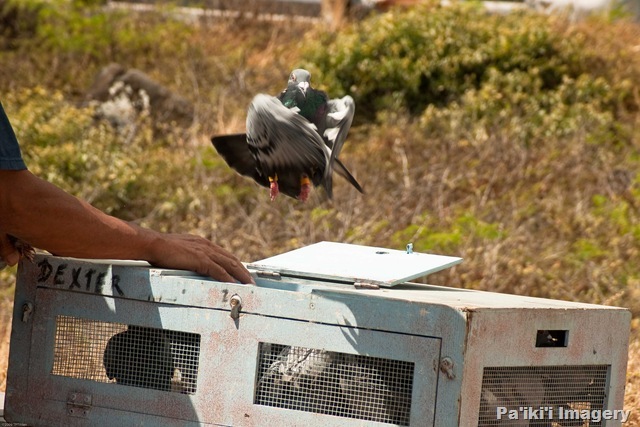 The next time you see a flock of pigeons beating wing from Makapuu you’re watching athletes in training. 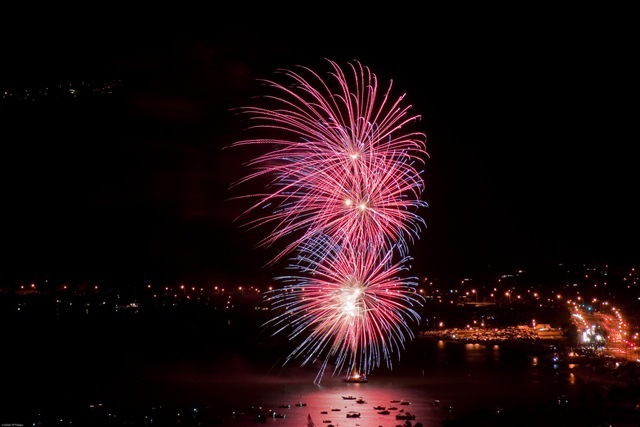 Last year I got pictures of the Maunalua Bay fireworks from ground level. The only drawback for me is the land on either side of the bay is mostly dark with no landmarks to give the fireworks scale and dimension. This year I walked up on top of Koko Head so I could look down on the display. In this picture the flash reflecting off the water showing the boats anchored nearby along with the street lights snaking behind the display provides a sense of height, depth and width.